This is a change from earlier versions of the SECTIONS model, where ‘N’ stood for novelty. However, the issues that I previously raised under novelty have been included in Section 8.3, ‘Ease of Use’. This has allowed me to replace ‘Novelty’ with ‘Networking’, to take account of more recent developments in social media. how important is it to enable learners to network beyond a course, with others such as subject specialists, professionals in the field, and relevant people in the community? Can the course, or student learning, benefit from such external connections? If the answer to this is an affirmative, then this will affect what media to use, and in particular will suggest the use of social media such as blogs, wikis, Facebook, LinkedIn, or Google Hangout. For instance, a course on Middle Eastern politics could have an internal discussion forum focused on relating current events directly to the themes and issues that are the focus of the course, but students may manage their own, public wiki that encourages contributions from Middle East scholars and students, and indeed anyone from the general public. Comments may end up being moved into and out of the more closed class discussion forum as a result. Other instructors are moving altogether away from ‘standard’ institutional technology such as learning management systems and lecture capture into the use of social media for managing the whole course. For instance, UBC’s course ETEC 522 uses WordPress, YouTube videos and podcasts for instructor and student contributions to the course. Indeed the choice of social media on this course changes every year, depending on the focus of the course, and new developments in social media. Jon Beasley-Murray at the University of British Columbia built a whole course around students creating a high level (featured-article) Wikipedia entry on Latin American literature (Latin American literature WikiProject – see Beasley-Murray, 2008). This is a particularly interesting development where students themselves use social media to create resources to help other students. 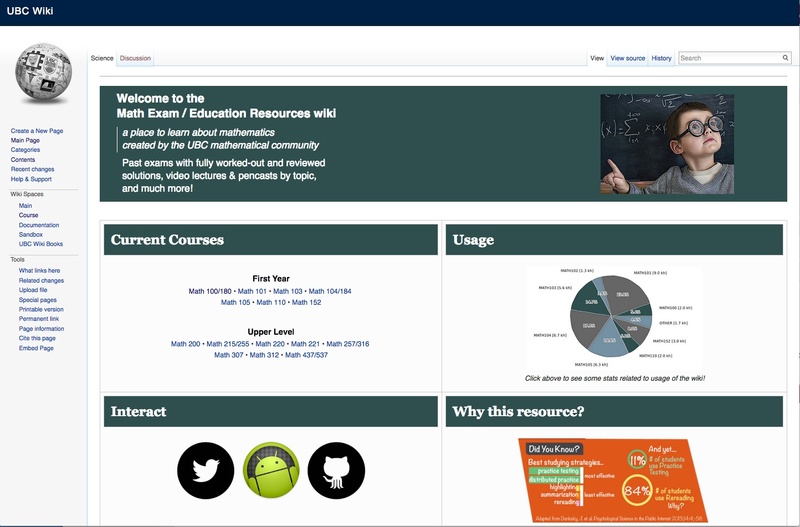 For instance, graduate math students at UBC have created the Math Exam/Education Resources wiki, which provides ‘past exams with fully worked-out and reviewed solutions, video lectures & pencasts by topic‘. Such sites are open to anyone needing help in their studying, not just UBC students. cMOOCs are an obvious example of self-managed learning groups using social media such as webinars, blogs and wikis. YouTube in particular is becoming increasingly popular for instructors to use their knowledge to create resources available to anyone. The best example is still the Khan Academy, but there are many other examples. xMOOCs are another example. Once again, the decision to ‘open up’ teaching is as much a philosophical or value decision as a technology decision, but the technology is now there to encourage and enable this philosophy. If this is important, what’s the best way to do this? Use social media exclusively? Integrate it with other standard course technology? Delegate responsibility for its design and/or administration to students or learners? 8.8 Networking by Anthony William (Tony) Bates is licensed under a Creative Commons Attribution-NonCommercial 4.0 International License, except where otherwise noted.